I made this for Wednesday’s sketch challenge (SC342) and Tuesday’s color challenge (CC332). All images are Our Daily Bread designs. 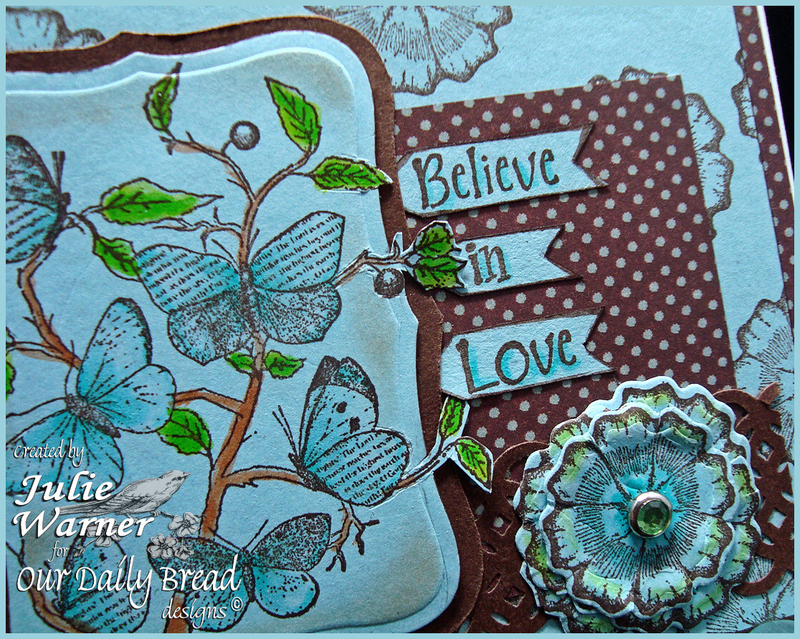 I stamped the butterfly branch and sweet william flowers w/ the choc ink onto the lt blue c/s. The butterfly image was cut w/ a label 8 using the out of the box Nestie technique. Two of the flowers were die cut w/ the blossom die and I used the rest for my lg bg. For the bottom strip, I used a strip of chocolate c/s punched w/ a double border punch. I hand cut the little sentiment banners. The finished card measures 5.5 x 4.25. SNS Sparkling Wintry Sensations Blog Hop! Welcome to the Sparkle N Sprinkle “Sparkling Wintry Sensations” blog hop! For my sparkling wintry card, I created a sheet of faux postage stamps using the pine forest image and a small, rectangular cut out (or reverse mask). I inked the forest w/ several colors of green pigment inks then stamped it inside the mask. I just moved the mask and repeated 5 more times. 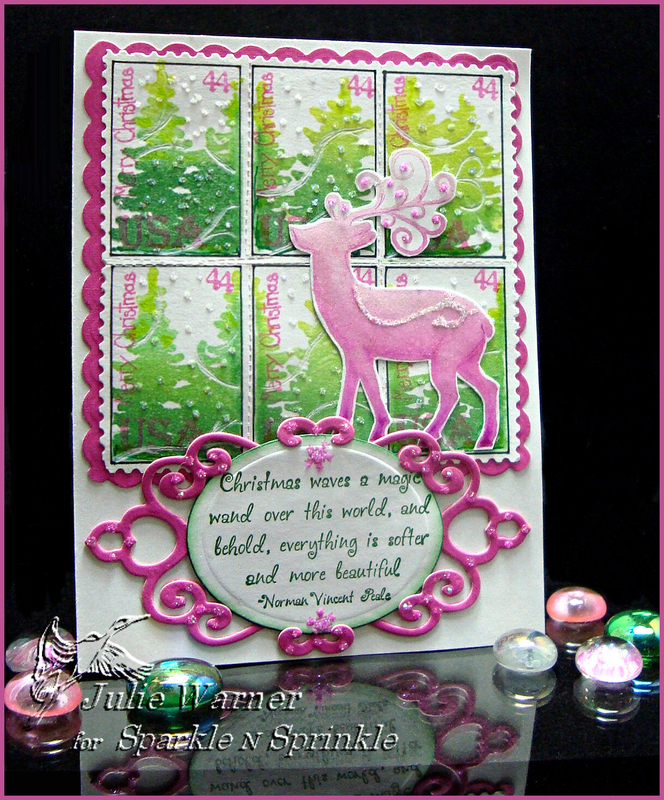 The wording and numbers were inked w/ a dk pink marker and stamped on top to complete the “stamp” look. I used a perforating blade in between the stamps and cut the outside w/ postage stamp scissors. The sentiment was die cut and attached to a fancy tag die cut. (Cutting this die is super easy w/ the Grand Calibur!) 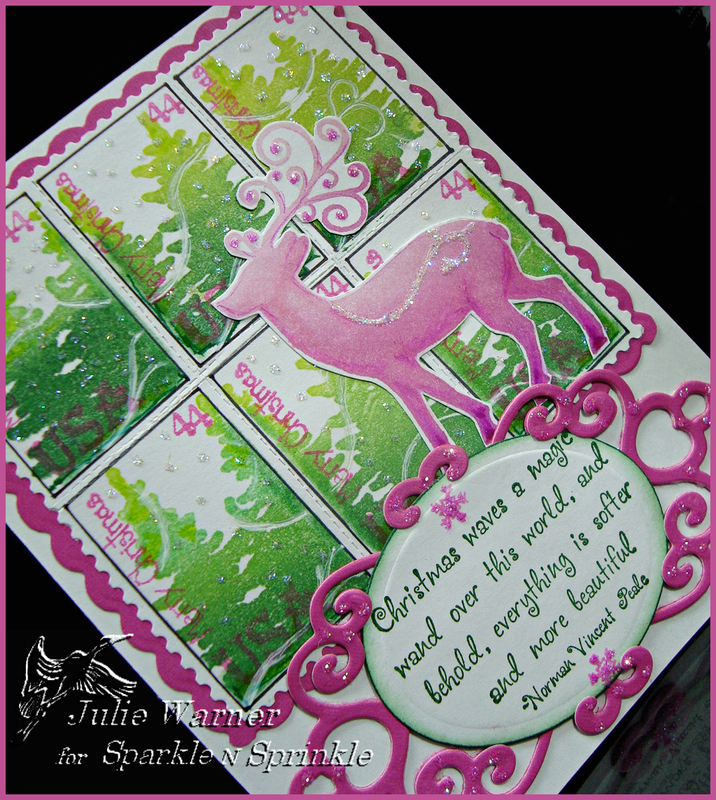 The reindeer was inked w/ the pink pigment inks, stamped an cut out. I used a glue pen and Sparkling Snow glitter on the reindeer and to add snowflakes to my postage stamps. I used the Mauvelous glitter on the fancy tag and reindeer antlers. The peony colored layer behind the postage was die cut using a scallop border die. The finished card measures 4.25 x 5.5. 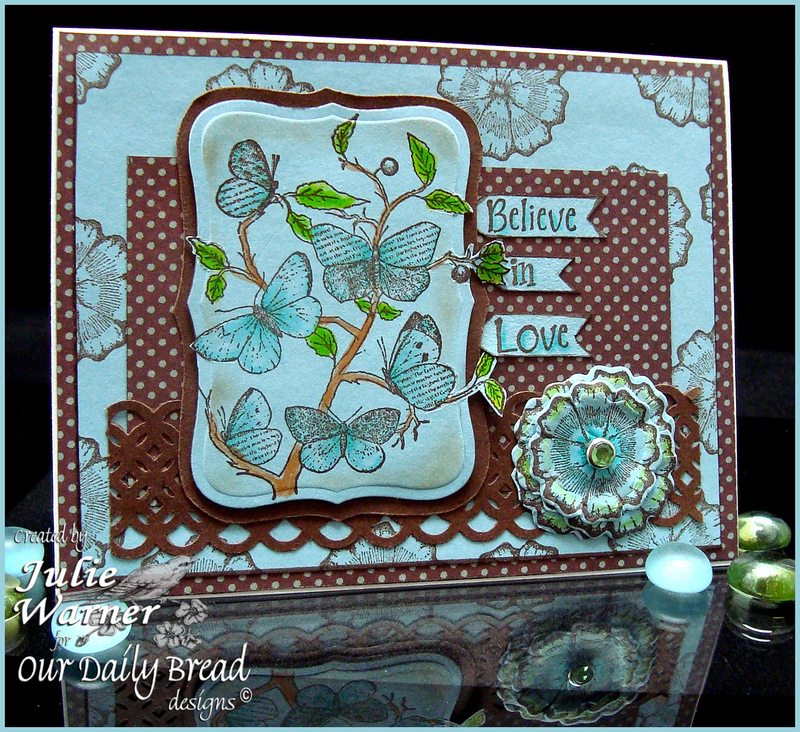 ODBD July Release Blog Hop! Welcome to the ODBD July 1 release blog hop! If you arrived here from Sabrina Jackson’s blog, you are in the right place! If not, you might want to start at the ODBD Blog where you will see the entire list with links just in case any are broken along the way! These new Sweet William images are just wonderful! They were made to coordinate with the Spellbinders Blossom 3. I stamped all the sizes on gold and purple tissue papers and also on some wide gold tulle ribbon and then die cut them. After stacking them, I put a gold brad through the center and wrinkled and distressed them within an inch of their lives, lol. 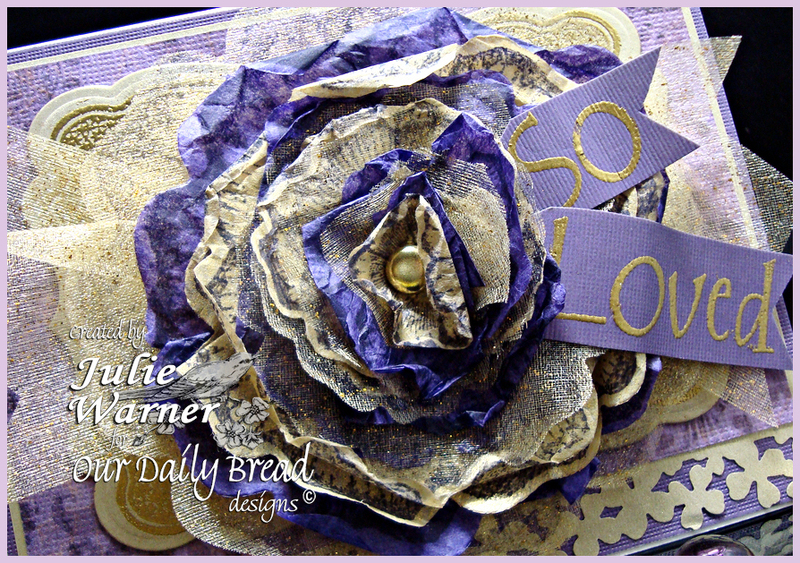 I added another piece of the tulle behind the flower then had to get creative with the gold embossed sentiment. This is one BIG flower and I didn’t have much room left on my 5.5 x 4.25 card. 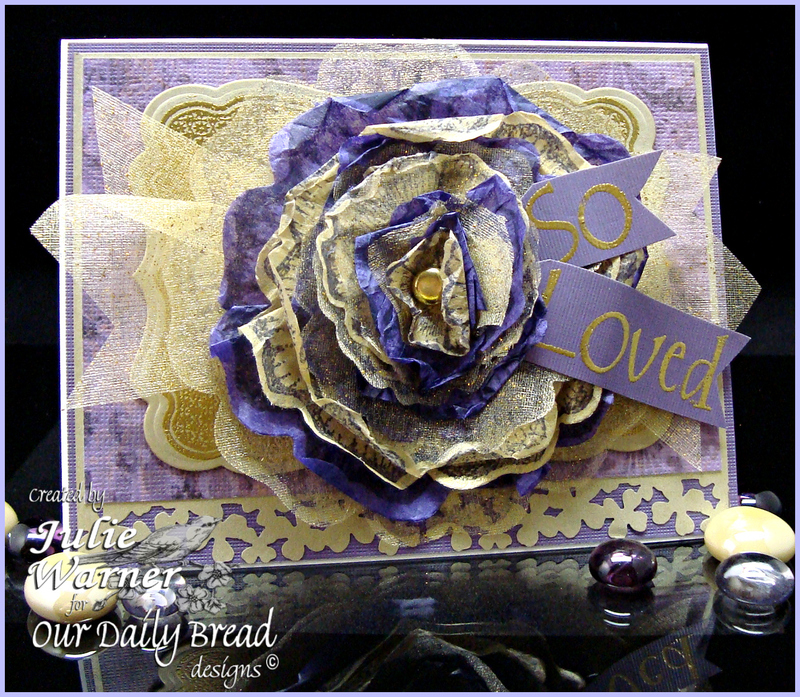 I used a border punch across the bottom of the gold layer and backed the flower with a gold embossed fancy label.